The musicians always start out skeptical about the new guy. They are not about to hand over the keys to the studio to just anyone. They know that producers are a mixed bunch: some are strictly engineers, others are arrangers, and some are musicians who have an idea of what they want to hear before anyone plays a note. As a sound engineer and producer for Atlantic Records, Tom Dowd integrated all of these talents in one knowledgable, gracious, and gentlemanly package. For his efforts he was rewarded with the trust of musicians and the music industry and was able to contribute to the success of the some of the most popular music of the 20th century. Was He Really Da Bomb? Near the beginning of Tom Dowd & the Language of Music, footage shows an atomic blast unleashing a mushroom cloud, followed by a series of snapshots from the history of pop and rock, the soundtrack pulsing with classic ’60s and ’70s music. Immediately I had to wonder whether Dowd’s entrance on the scene really deserved an atomic explosion. His work on the hit “If I Knew You Were Coming, I’d Have Baked a Cake” launched him in the record business. He was dazzled when he was tapped to help Dizzy Gillespie and other popular musicians he admired with their recording. He then helped musicians like John Coltrane, Ray Charles, Aretha Franklin, and Eric Clapton make some of their greatest recordings. But before his career as a sound engineer took off, he was drafted in 1941. He worked in the physics department at Columbia University, where his nuclear research contributed to the Manhattan Project (thus explaining the mushroom cloud at the beginning). When Cold War security barred the results of the research undertaken during the war, however, Dowd found he couldn’t get credit for his university work. Music called. Dowd’s tenure in the recording industry, starting in 1947, came at a pivotal moment in technological history. In Dowd’s early days, recording was extremely primitive, with sessions conducted around a single microphone and etched onto vinyl. Dowd describes how over time he developed and advanced the technology of multi-track recording, creating new consoles that allowed musicians to mix instrument levels individually for the first time in history. Being able to manipulate individual tracks, easy to take for granted in the digital age, was a tremendous breakthrough in the world of recorded music, and it’s fascinating to hear musicians and record execs alike describe just how much impact that development had. The documentary tours Dowd’s New York, including the 1950 office of Atlantic Records, where Dowd designed the recording studio and the equipment. It gives you a little thrill to learn of this tiny office building, the top floor of which served as not only the offices of Atlantic Records but also the studio where Ray Charles, The Clovers, the Drifters, Ornette Coleman, John Coltrane, recorded. Atlantic now occupies a steel-and-glass behemoth far from that shabby midtown street. Sometimes a forced enthusiasm, like that in the scenes between Dowd and Lynyrd Skynyrd, is cringe-inducing. But it was worth enduring to hear Ray Charles talk about learning to be himself, “just like your mamma tells you to be,” instead of imitating the more successful artists of the moment. I loved learning how Les Paul discovered that a railroad tie made the best solid-body electric guitar, and hearing Dowd recount how John Coltrane would stand in a corner of the recording studio, rapidly switching instruments and swapping out reeds, privately listening to the acoustics of the room for hours at a time before recording sessions. If Dowd felt any bitterness that he “worked for hire” for Atlantic and as a result is not a multimillionaire for having engineered the success of so many bands, he never let it show. At moments in this documentary he does reveal his pride, his eyes flashing with arrogance when he has learned something that others don’t yet understand. In one tale of Dowd’s prowess, Derek Trucks recalls a session when the Allman Brothers Band played a song they were recording, finished, and put all their gear away before they realized they hadn’t played the song the way they had wanted to arrange it. Dowd told the group to go out for a while. When the band returned a couple of hours later, he had used a razor blade to edit and resplice the various tracks on the master tape, rearranging the second verse the way they wanted it. “And that’s what’s on the record,” Trucks marvels. Producer-to-the-stars Tom Dowd saw immense advances in the technology during his brilliant career. He earned his reputation by becoming an expert not only at coaxing the best sound from every new combination of musicians and equipment but also at coaching the musicians to be and play their best. By the time I’d spent a couple of hours soaking up Dowd’s joy at being at the center of the sound he loved, I was sad to learn that he died in 2002. “Music has been very kind to me,” gushes Dowd early in the documentary. As his stories and the other interviews progress, it is clear that most of the musicians interviewed would probably argue that it was he who was very kind to music. 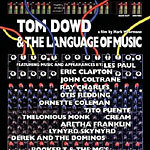 Music enthusiasts and recording technology buffs alike will want to explore the three deleted scenes and more than 90 minutes of additional interviews with Dowd and his peers on the DVD’s special features, which provide excellent amplification of Tom Dowd and the Language of Music’s discussions of recording technology, assorted rock-and-roll adventures, and studio heroics. A “Making of the Studio Shoot” featurette fills out the offerings. As you might expect from a film about a sound engineer, the sound is clear, the interviews easy to listen to. There’s some great concert footage of Otis Redding, Aretha Franklin, and some of the jazz musicians. A minor quibble: The occasional use of titles would have made it easier to know who was featured in the interviews or the music clips.